The NERV is playing the Cyclocolypse Grand Finale show with Cyclocide and Space Toilet at the Flava Packet. The show will be the after party to a bike messeger style, beer fueled, freakbike crashing, dirty, cheating, SCAVENGER HUNT! Hosted by none other than Oakland’s BLACK LABEL Bicycle Club! There will be PRIZES awarded to the BEST teams, to the WORST teams, and of course to the most CHEATenest dirty scoundrel teams. 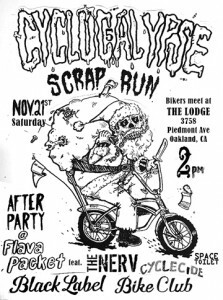 To ride in the scavenger hunt, show up at 2pm at The Lodge 3758 Piedmont Ave, Oakland, CA. Afterparty starts at 7 at the Flava Packet.